A year’s worth of hype EXCEEDED. This will NEVER happen again. You just blew my mind, Christopher Nolan. Did I just RT myself in a blog post? Yes, yes I did, but I’ve honestly sat here trying to express my sentiment in some other way, and I really can’t. Something else not possible is doing this movie justice, but screw it, it’s my blog, and there are thoughts swimming around in my mind. This movie is all about the mind. The mind, ideas and dreams. But what about Christopher Nolan’s mind?! How the hell did he come up with something like this?! The concept itself is fascinating, and God knows how many hours I will spend reading about how dreams actually work as a result of watching Inception, but from a simple idea about dream stealing to a movie like this? Unfathomable. Some other worldly being must have led an inception into Nolan’s mind and planted this after an intergalactic bet. I don’t see how Inception cannot win the Oscar for Best Film Editing next year. The way we were so gloriously transported between four dream layers, all with their relative timeframes, was a sheer delight to watch, and seriously deserves recognition at the highest level. The cinematography was stunning, the acting superb, especially Leo, and Hans Zimmer’s score, with that ominous, droning sound, was pitch perfect. I’m going to see Inception again. It’s not that I want to. I really need to. @andrewlitvak, @dkeeghan and I sat through the credits, trying to unravel and comprehend what had just happened, and already forming some theories on the ambiguity this movie presented. At a basic level, we agreed that there were four dream layers, with the fifth being The Void. There is a THIRD possibility — It neither stopped… nor kept spinning. The story ended before either could happen. Discuss. People seemed to think this was mind blowing in some way, but I don’t think it makes any sense at all. The state in which it ended, with Cobb, was either reality or another layer of the dream, with the inception being performed on him [I’m siding with the latter]. Regardless, I don’t see how there can be a middle ground, unless he means The Void / Dreamscape. I’m really liking Hal Phillips’ theory, the gist of which involves Ariadne leading an inception on Cobb, with what we see as reality being the second layer of Cobbs’ dream. To make this work, they must go five levels in, and they can only do that through what the film calls “running with Mr. Charles”. They must turn Cobb’s subconscious against him and trick him into going deeper by convincing him he is running an inception of his own on someone else. The highest “reality” we are shown is actually a dream (level 2). In this level, Cobb is a vigilante on the run. The forces out to get him are actually projections— his defense system. (Mal makes that comparison toward the end.) He is given a strong incentive to perform an inception on Fischer— who, in level 1 reality, may not even exist. I feel that Ariadne, under the guise of a noob in the tutelage of Cobb, is completely in the know, and she forces the issue when Cobb is ready to give up. I’m going to try and watch it with this in mind next time around and see how it plays out. It’s not often you can read so much about a movie after you’ve seen it, and still be so excited to watch it again, and possibly glean a completely new meaning of what the story is conveying. When the elevator doors opened on Level 12 of the Medina Grand an hour or two ago, I walked out into the hallway and felt 99% sure that gravity would cease to exist. I’m expecting the water in the half empty glass I’m looking at to start moving to one side. And I’m looking forward to falling asleep and dreaming. Recursively! 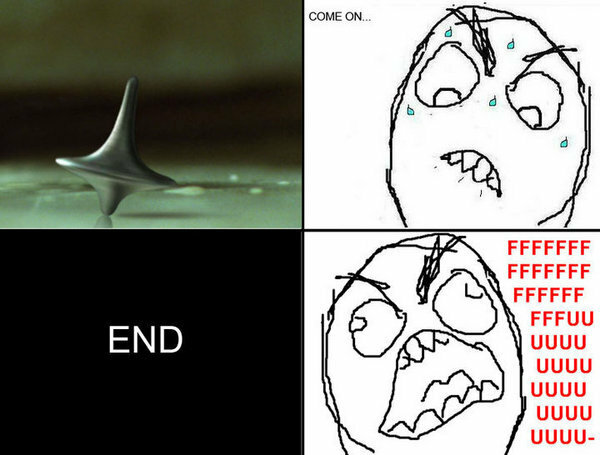 This Inception FFFFUUUU image was too funny not to include. I too think it’s his dream. the clincher for me was how they said the totem could/should not be touched by anyone else – yet Cobb uses his wife’s totem, touched and used by her! !let see this again couP! I think I’m going to see it several more times >.< Preferably with a notepad. Been reading so much about it lately, like just today, where they were saying it might not ALL have been a dream, but it started becoming one after he first spoke to his kids, and he entered that room in Mombassa. "They come here to be woken up. Their dream has become their reality. Who are you to say otherwise?"